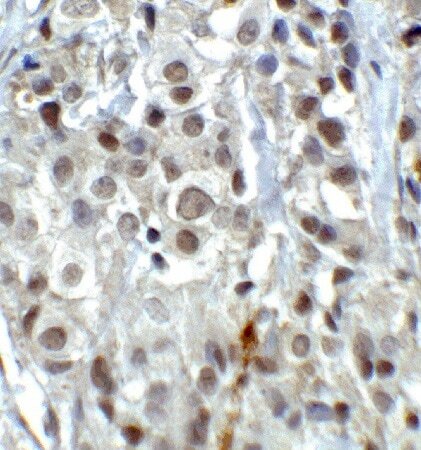 Mouse P815 cell lysate IHC-P: Human prostate FFPE tissue sections. Our Abpromise guarantee covers the use of ab37165 in the following tested applications. IHC-P Use a concentration of 2 µg/ml. WB Use a concentration of 1 - 2 µg/ml. Detects a band of approximately 105 kDa (predicted molecular weight: 93 kDa). Histone demethylase that demethylates both 'Lys-4' (H3K4me) and 'Lys-9' (H3K9me) of histone H3, thereby acting as a coactivator or a corepressor, depending on the context. Acts by oxidizing the substrate by FAD to generate the corresponding imine that is subsequently hydrolyzed. Acts as a corepressor by mediating demethylation of H3K4me, a specific tag for epigenetic transcriptional activation. Demethylates both mono- (H3K4me1) and di-methylated (H3K4me2) H3K4me. May play a role in the repression of neuronal genes. Alone, it is unable to demethylate H3K4me on nucleosomes and requires the presence of RCOR1/CoREST to achieve such activity. Also acts as a coactivator of androgen receptor (ANDR)-dependent transcription, by being recruited to ANDR target genes and mediating demethylation of H3K9me, a specific tag for epigenetic transcriptional repression. The presence of PRKCB in ANDR-containing complexes, which mediates phosphorylation of 'Thr-6' of histone H3 (H3T6ph), a specific tag that prevents demethylation H3K4me, prevents H3K4me demethylase activity of KDM1A. Demethylates di-methylated 'Lys-370' of p53/TP53 which prevents interaction of p53/TP53 with TP53BP1 and represses p53/TP53-mediated transcriptional activation. Demethylates and stabilizes the DNA methylase DNMT1. Required for gastrulation during embryogenesis. Belongs to the flavin monoamine oxidase family. The SWIRM domain may act as an anchor site for a histone tail. 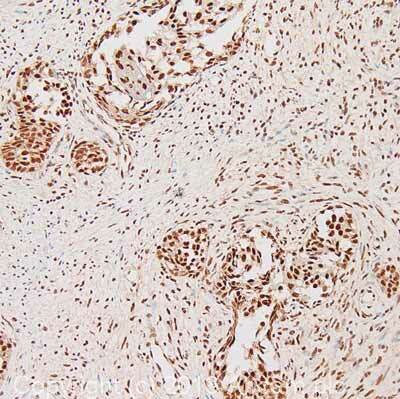 Immunohistochemistry (Formalin-fixed paraffin embedded sections) of human breast carcinoma tissue labeling KDM1 / LSD1 with Anti-KDM1 / LSD1 antibody (ab37165) at 2μg/ml. IHC image of KDM1/LSD1 staining in human prostate formalin fixed paraffin embedded tissue section, performed on a Leica Bond system using the standard protocol F. The section was pre-treated using heat mediated antigen retrieval with sodium citrate buffer (pH6, epitope retrieval solution 1) for 20 mins. The section was then incubated with ab37165, 1µg/ml, for 15 mins at room temperature and detected using an HRP conjugated compact polymer system. DAB was used as the chromogen. The section was then counterstained with haematoxylin and mounted with DPX. Publishing research using ab37165? Please let us know so that we can cite the reference in this datasheet. There are currently no Customer reviews or Questions for ab37165.